Malcolm Watts of Emmanuel Church in Salisbury, England recently preached this message on the Lord's Supper. 1. He takes Psalm 104:15 ( "And wine that maketh glad the heart of man, and oil to make his face to shine, and bread which strengtheneth man's heart.") 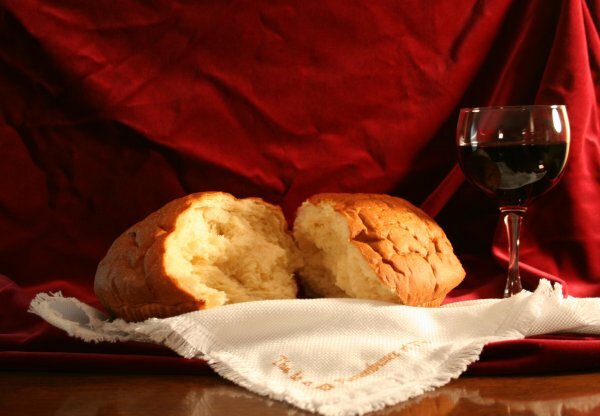 as a spiritual reference to the Lord's Supper. 2. He argues for the observance of the Lord's Supper in an evening meeting. The Passover took place in the evening (cf. Exod 12:6). Jesus instituted the Supper in the evening. He observes that Paul's reference in 1 Corinthians 11:23 to Christ's institution of the Lord's Supper "the same night in which he was betrayed" means that the timing of the meal may point to more than mere circumstance. 3. He argues for the best posture for the meal as being seated around a table.